Award 2013 was granted for Ville Kairamo due to an exceptional contribution in creating an open innovation platform concept, in Finland and abroad. The successful Demola innovation platform enables students and universities to develop new products and services together with companies, to solve pressing real-world problems and challenges. Demola has, under Kairamo’s leadership, made outstanding innovative achievements in facilitating university, industry and regional cooperation, whilst proactively taking advantage of international opportunities. 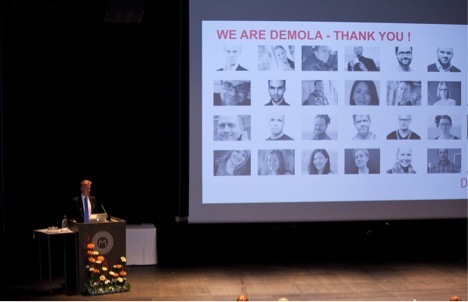 During the first three years, over 200 services and prototypes have been developed by Demola. Kairamo’s leadership has been a truly cross-border example of innovation, and has made him a positive role model for many young persons in different international communities.